During the Japanese colonization of Korea, young Korean woman, Sook-Hee (Tae-ri Kim), is hired to serve as a handmaiden to a Japanese lady called Hideko (Min-hee Kim) who is living with her uncle (Jin-woong Jo) in a grand, secluded house. However, Sook-Hee is secretly plotting with a conman - a man who calls himself Count Fujiwara (Jung-woo Ha) - in an attempt to defraud Hideko of her large inheritance. The pairing of a masterful storyteller and a visionary filmmaker is always exciting. As a result, expectations were high when director Park Chan-Wook announced his intention to adapt Sarah Waters’ best-selling book, Fingersmith. If you haven’t read Waters' novel, you are in for an absolute treat. Superbly portrayed by the entire cast (with stand-out performances from Tae-ri Kim and Min-hee Kim) The Handmaiden has many thrilling twists and turns. Amid the narrative shocks, Park Chan-Wook's film also features tender (often graphic) eroticism, surprising moments of humour and disturbing scenes full of twisted darkness. This is a sensual and sumptuous movie that grips from beginning to end. 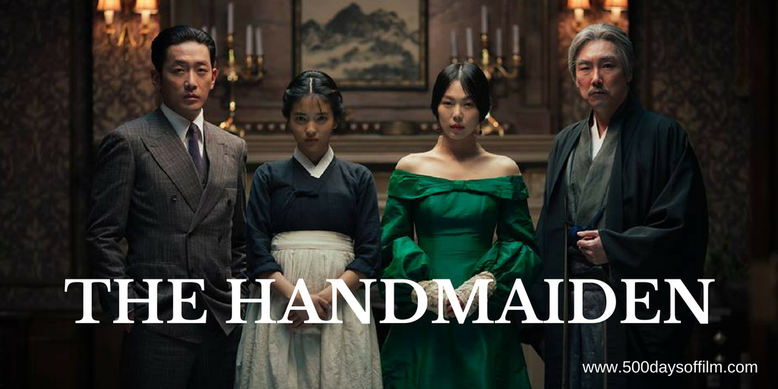 If you (like me) have read Fingersmith, the real excitement of The Handmaiden lies in how the director of such stunning films as Oldboy and Stoker would translate the story (originally set in Victorian England) to 1930s Korea. The answer is... wonderfully. For a start, Waters’ story fits this era perfectly. In addition, Park Chan-Wook's exquisite visual eye and his (endlessly impressive) attention to detail make for an utterly divine viewing experience. Every atmospheric scene looks stunning. Each cinematic element is impeccably designed to draw you into this gloriously twisted tale - from the camera movement and lighting to the locations (the main house is fabulous with its combination of Western and Japanese styles), from the breathtaking costumes to the gorgeous score. Indeed, I was so swept up by The Handmaiden’s visual beauty that I forgot I was watching a film by the director of Oldboy. The final act, with its excruciating torture scene, came as a rather brutal reminder. However, while the story often unsettles with its many dark moments and unexpected twists and turns, The Handmaiden is, at heart, a visually stunning, wonderfully romantic film. Highly recommended. Park Chan-Wook originally intended to shoot The Handmaiden in 3D. He thought that this would emphasise the perspective of each character. However, the director could not make 3D work financially. Instead, the director used camera movement as a replacement fpr 3D - a decision that works superbly throughout the film. Have you seen The Handmaiden? If you have, what did you think of Park Chan-Wook’s sumptuous film? Let me know in the comments section below or let’s discuss movies over on Twitter or Facebook (@500DaysOfFilm)! Oh, this is such a magnificent film and Chan-wook is a master of his craft. Every film if his that I've seen is gorgeous from a aesthetic standpoint and weaves wonderfully twisted tales. I encourage you to check out more of his work beyond Oldboy, if you haven't already. Thanks for reading my review! I absolutely agree with you... I really do need to watch the other two films in Park Chan-Wook's Vengeance trilogy. I also fancy watching Stoker again!